There are specific times when a major bathroom remodeling project may be needed. One such instance is when a person or family decides to upgrade the bathroom in their first home now that they have saved up some money. Another such time is when the family expands with the addition of a few children, thus necessitating the need for more room. However, there is a situation that most people don’t consider when thinking about future bathroom remodeling projects: getting older and becoming a senior citizen. It’s an inescapable fact of life is that everyone gets older, but All About Bathrooms has some useful bathroom remodeling ideas for seniors. It’s a long lamented fact that as a person gains in wisdom; their physical abilities begin to fail. Arthritis creeps into the joints, vision becomes increasingly murky, canes or walkers are needed to move around, and other ailments wreak havoc on an individual’s body. Getting older makes it far more difficult to safely move around, which can be a detriment for those seniors who wish to remain at home and independent, and this difficulty is definitely carried over into the bathroom. Even if a family took in an older member of the family, some changes in the bathroom itself can make a world of difference. The design experts at All About Bathrooms have some great ideas concerning bathroom remodeling for seniors. One of the most important bathroom remodeling ideas for seniors is to minimize the risk of falling. 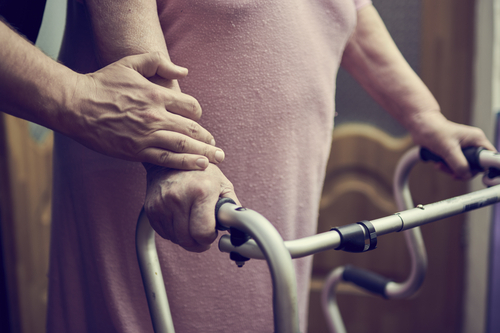 Last year, 13,600 seniors of the age 75 and over died from falling within their home. This is why All About Bathrooms always recommends installing grab bars in a bathroom to help seniors move around much more comfortably and safely. Grab bars can be installed next to the toilet, tub/shower, sink, and even in the tub/shower itself. Even better is that there can be some style and flair incorporated as there are many different styles and colors of grab bars to choose from. The days of being forced to use only the metallic hospital tube style of grab bars is long gone. Of course, All About Bathrooms will make sure that the grab bars can handle the pressure by putting in the proper support in the walls. Another integral part of a bathroom remodeling for senior citizens project concerning falling is to install anti-skid tile, of which there is quite an array to choose from. The centerpiece of any bathroom is the toilet, and there are some ideas that can be implemented to help seniors. One method is to adapt the toilet by installing a seat extender. Although, All About Bathrooms typically recommends purchasing a senior-friendly toilet, which has the height of a normal chair and makes sitting down and getting up far more easier than a standard toilet. Of course, it is recommended to install grab bars as well to give seniors something to hold onto while raising or lowering their bodies. The sink and vanity are areas that most people don’t think about when considering bathroom remodeling ideas for seniors, but All About Bathrooms does. A wheelchair accessible sink, which has space for a senior’s wheelchair under it, is a tremendous idea. The faucet should be a lever handle model to make turning the water on and off easier for the senior. Grasping and turning a knob can become very difficult as one gets older and arthritis takes hold. There are even models that feature pedal controls to make using the faucet even easier. Another important consideration concerning faucets is to choose one that has anti-scald protection to help prevent burns. As for the vanity, it too should be wheelchair accessible and all the necessary items should be reachable from a sitting position. A mirror that can be tilted up or down can also be beneficial to seniors if they’re sitting down or have lost height due to stooping. Probably the main focal point of any bathroom remodeling project for seniors concerns the shower and/or tub. The typical tub can be extremely hazardous for an older person to get into and out of, but All About Bathrooms has some remedies. A walk-in tub can negate the dangers of trying to step over a tub’s rim. A shower seat can be used in a tub or shower to provide a safe spot for the senior to sit and bathe. An increasingly popular choice for showers is a curb-less shower that allows a wheelchair or walker full access, not to mention greater room to move about. Many curb-less showers have a seat that can be folded up to allow a wheelchair the necessary room to maneuver. Just like the sink faucet, the shower should feature levers and have anti-scald protection. An adjustable shower head is great for seniors, but a hand-held one is even better. That way, they can sit comfortably on the shower seat and use the shower head to comfortably clean themselves. As in other parts of the bathroom, grab bars should be installed to make moving around easier and safer. As one can see, there are quite a few bathroom remodeling ideas that can be implemented to help senior citizens. The design experts at All About Bathrooms can help the homeowner choose the right options to allow for the maximum level of ease, comfort, and safety of seniors in the bathroom. Some of these options include non-skid tile, senior-friendly toilets, wheelchair accessible sinks, walk-in tubs, grab bars, and curb-less showers. Another useful suggestion is to increase the level of lighting to help seniors see more clearly as they use the facilities. The right choices can transform a daunting bathroom for seniors into a welcoming one.